Developed originally as a commercial, dual-purpose breed but later replaced by hybrids, Delawares today make excellent backyard chickens. They typically lay four, large, brown eggs a week far into the winter months. 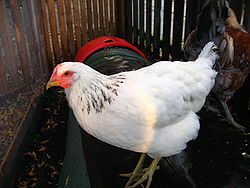 Delawares mature quickly and produce a clean, white-meat table fowl. 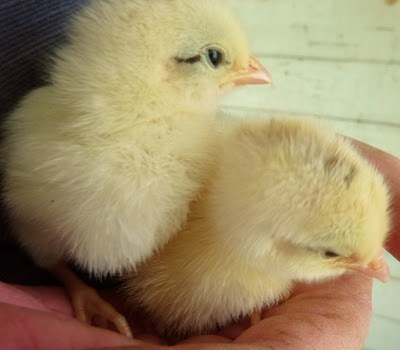 Chicks develop feathers quicker than most breeds. Robust, they handle both cold and heat well. 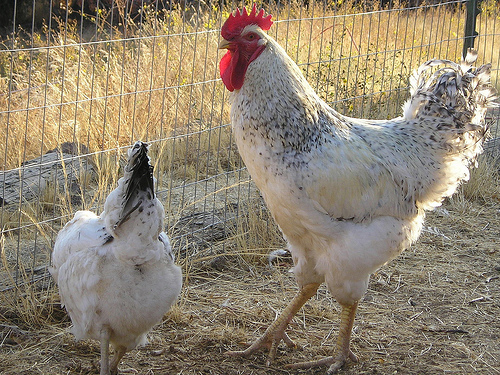 Unlike present day commercial breeds, they do well as a free-range, foraging chicken. Delawares have dwindled to a few hundred birds. Many breeders keep them today with the goal of preserving the Delaware as one of America’s heritage breeds. Delawares bear confinement well. Generally a docile breed, Delawares get along with each other and their humans. They submit to handling without a fuss. However, the occasional rooster will exercise his rights to aggressive behavior. Owners describe the hens as broody but good mothers. On the whole Delawares have a mild, quiet, and calm disposition suitable to the backyard chicken farmer. The Delaware breed and temperament really offers the best of both worlds. They possess all the potential of a commercial breed with all the personality of a backyard chicken. The Delaware unlike many chickens has only one variety—the Barred Silver Columbian. The rooster weighs eight pounds and the hen six. They both have predominantly white plumage. The rooster has black bars on his white tail feathers. She has black tail feathers with white lacing. Both have black baring in their hackles. They sport moderately large pea combs and wattles. The rooster has a very impressive red, five-point comb worthy of any child’s depiction. Delaware hens have smaller combs. Owners describe them as a robust, muscular, and substantial breed. Adaptable to hot or cold the Delaware makes a good choice for the first-time chicken rancher. Protect their large comb and wattles during cold spells. Some breeders have used an application of petroleum jelly as temporary protection against frostbite. For long term protection build an insulated, draft-free coop. Take advantage of the Delaware’s dual-purpose status. Provide good layers good bedding and artificial lighting for maximum egg output. Delawares came on the poultry scene relatively late in agriculture history and had little chance to establish themselves prior to the onset of hybrid breeds. Help establish and propagate this heritage breed. As the name implies Delawares came from Delaware, United States. They came to the poultry party late in 1940. 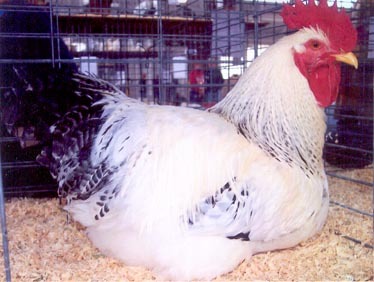 George Ellis crossed a New Hampshire Red and a Barred Plymouth Rock with the goal of maintaining the egg laying capabilities of both but creating a breed with increased meat potential. Delawares provided table meat to the entire east coast for a decade. In 1952, at about the same time as the American Poultry Association declared them an official breed, they found themselves replaced by the new commercial hybrids. By the late 1990’s the American Livestock Breeds Conservancy estimated the total number of Delaware hens at fewer than 400. The breed has experienced some resurgence thanks to American heritage breeders.